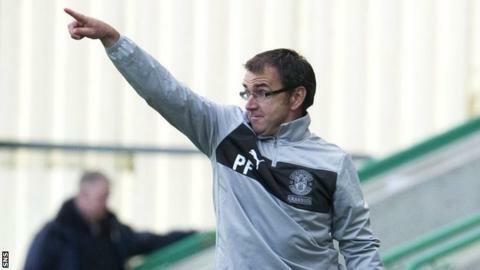 Manager Pat Fenlon credited the work-rate and commitment of his Hibernian players for their promising start to their league campaign. A hard-fought 2-1 win over Kilmarnock means they sit second in the Scottish Premier League table after six matches. "The honesty and desire to get the blocks in and get their bodies in the way was very good," Fenlon said of his players. "We've got players in there who want to work hard." Hibs edged the match through a mixture of Leigh Griffiths's talent, slack goalkeeping by Killie's Kyle Letheren, a generous penalty award and some excellent defending. Griffiths's in-swinging corner in the 14th minute found the net when Letheren made a hash of clawing it clear but Hibs looked good for a goal lead at that point. They handed the Ayrshire side a lifeline, though, when Ben Williams and his defenders barged into one another, allowing Danny Racchi to level. But a rather fortuitous penalty decision, when referee Steven McLean decided Ryan O'Leary had fouled Paul Cairney, set up Griffiths to score expertly from 12 yards and from there Hibs held firm. Fenlon told BBC Scotland he would have "had a chuckle to himself" if someone had suggested his team would be second top in September, but he is pleased at how things are progressing after a torrid first season last term. He said: "It's credit to the players. "Against Dundee United, away, on the first day of the season we didn't perform at the levels that we can, but every game since then I think we have got to some decent levels in terms of commitment and work rate. "I think pre-season was tough. We got them fitter. "We've got competition in there at the moment. If you are not up to the mark, there is someone to take your place. "We are not in a position financially to add to the squad but we are more than happy with the group we have. "We had 29 players when I came in last year, which was too many, and we can't hold that sort of number any more. "But now it gives the younger boys a chance to get involved in the first team." Despite their lofty league position, Fenlon is not fooled that the improvements they have made to date will sustain them throughout a long season. He continued: "We're still a long way from the finished article, we know that. "We need to retain the ball better at times and believe in ourselves a bit more." And the manager thanked the fans, close to 10,000 of them, for backing the team when Killie pushed for the leveller. "There was great support today," he said. "They have had a hard couple of years. They sensed we were under the cosh a bit and they got behind us at that stage. We needed it, it gives you something to hang on to."